Enough with the kerazy contraptions! It's been a big week for Samsung, and I've been watching the parade of new products with a mix of admiration and amusement. PJ O'Rourke once described Russian mafia wives as running naked through clothes shops, covered in Krazy Glue, keeping whatever stuck; Samsung seems to have done the same in a branch of Radio Shack. How else can you explain the Samsung Galaxy S4 Zoom, which is a smartphone with a compact camera glued to it - or the Samsung Ativ Q, which runs both Windows 8 and Android? There are plenty more where they came from. There's the dust-proof, waterproof Samsung Galaxy S4 Active, which is designed for mermaids and moles. 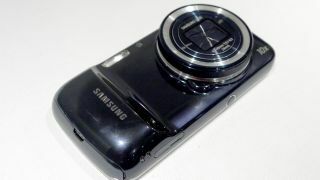 There's the Samsung Galaxy NX, which is a DSLR-sized camera with a Galaxy shoved into it. There's the Samsung Galaxy Galaxy, which is a Galaxy with a secret compartment for storing Galaxy chocolate bars. And there's the Samsung Galaxy Horse, which is a Galaxy stapled to a horse. Only two of those are made up. At last week's WWDC, Apple's PR message was all about the importance of doing one thing really well. Samsung couldn't be more different. I think their R&D people just get drunk and throw darts at an Argos catalogue, cutting out whatever they hit and gluing it to whatever happens to be handy. "Samsung Galaxy Toaster! " they cry. "Samsung Galaxy Trampoline!" It's easy to mock, but there's a serious point to all of this: Samsung is a company that releases stacks of products, some of which work pretty well and some of which don't. And to me it looks like it's doing with the Galaxy brand what it has long done with its TVs and fridge freezers: churn out endless variations of the same thing to try and appeal to every single potential customer. No niche is too small. No combination is too weird. There's absolutely nothing wrong with chasing market share or profits - but I do wonder if the super soaraway Galaxy S3 made Samsung look like a different kind of company. According to Reuters, analysts got overexcited, assumed the S3 was the beginning of an Apple-style purple patch and massively overestimated sales of the S4 - and now they've sobered up, they've lobbed a massive $20 billion off the value of the company. I do wonder if Samsung's innovative qualities have been overstated: as our review of the non-Active non-Zoom non-Mini Galaxy S4 noted, it is a "very, very good Galaxy S3"; by shovelling every idea it could think of into the phone, Samsung was "coming up with ideas for the sake of something new". Waterproof S4s and smaller S4s are all well and good, but they're iterations, variations, products from a company whose only concern is profit, not perfection. And that's fine, but I do wonder what's next in the product pipeline. Samsung Galaxy S4 Oven Gloves?